from our fabulous range, choose from several styles. 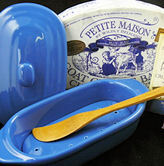 Brie Bakers are one of our most popular gifts all year round. Super easy to use, and a great ready to go party food. It is one of the easiest things to make, almost guarantees compliments, and is usually devoured within minutes. Click here to see our range of Bries and Camemberts suitable for our Bakers. Natural, superb Brie or Camembert in its most ooey, gooey, delicious spreadable self.